Planning Sustainable Solutions assists communities and individuals to realize their sustainable development initiative, project or dream. Please see Global Ecovillage Network Australia's Facebook page for events Shane may be involved in. Design and development of communities, residential developments and rural developments that wish to adopt ecovillage principles. 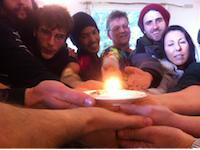 Running training in the four dimensions of Gaia Educations Ecovillage Design cirriculum from individual sessions on Economic, Social, Ecological or Spiritual dimensions to a complete course. 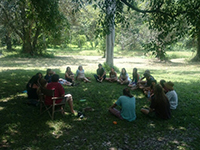 Can lead groups in the 'Changing the Dream' symposium and Deep Ecology processes. Support through the initial planning stages of the project – planning applications, planning scheme amendments, building permits and other local government requirements in three states (VIC, NSW and QLD). Assist with business plans, organizational structures and funding options. Community structure, Ecovillage Design, Land trusts, Community Title. Advise on ecologically sustainable buildings and development, natural systems and permaculture. Foster networks with the right people, build supportive relationships, and influence government authorities and the local community. 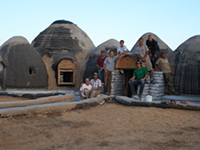 Building with low impact, low cost materials of either cob or earthbag technologies. Sculptured buildings, landscape features or retaining walls. Help with the day-to-day operations of your project, such as meeting facilitation and efficient process design, so that you achieve your project goals.